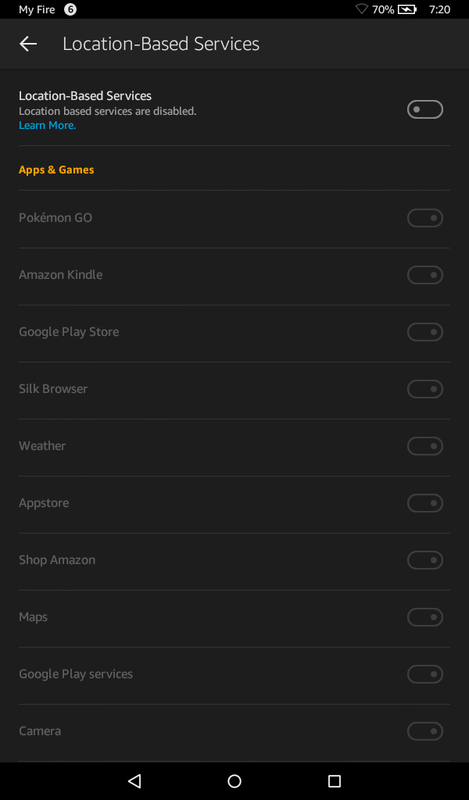 Follow our easy tutorial to download and install Pokemon GO to your Kindle Fire or Amazon Fire tablet. 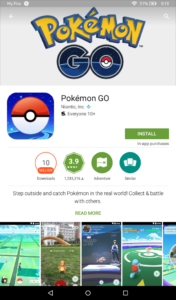 This tutorial will show you how to download the Google Play Store to your tablet and install Google Maps (you will need this to run the game correctly) and Pokemon GO. You do not need to root your device. 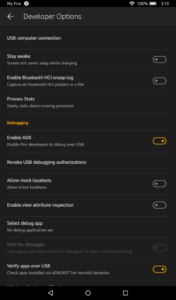 This is confirmed working for the $50 Amazon Fire tablet and should work for all Fire devices running Fire OS 5 Bellini. It should prompt a Use location? pop-up (this may also pop-up automatically when you launch Google Maps). Press Yes. You should now see your location in Google Maps. Exit Maps and now run Pokemon GO! 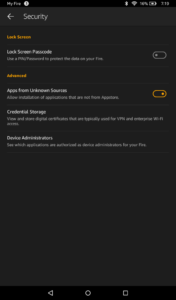 Note: In order to play Pokemon GO on the Fire tablet, you will always need to be connected to the Wi-Fi, therefore limiting your ability to catch Pokemon anywhere. We suggest you tether off someone’s phone, go to public areas with free Wi-Fi, or use incenses to attract Pokemons towards you. Parse Error: If you are getting a parse error while installing any of the Google Play services to your tablet, this can mean the file is corrupted or your OS may be too old. To fix a corrupted file, please try re-downloading the file. If your OS is too old, you will need to update your OS to the latest version, however keep in mind that some older devices cannot be updated to a compatible OS. Your device needs to be on Fire OS 5 (Bellini). 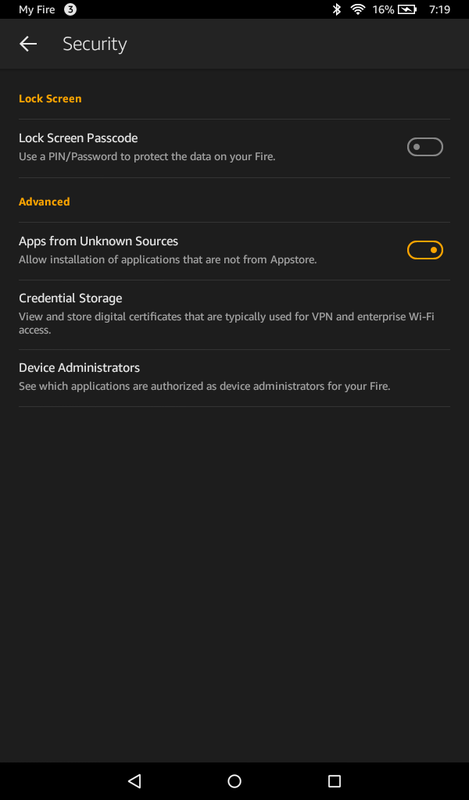 Check your device’s compatibility here (scroll down to the chart at the bottom and check if your device can run Fire OS 5). Failed to Detect Location: Turn off “mock locations”. Please note that this is turned off by default and you will need to enable Developer Options to access this option. 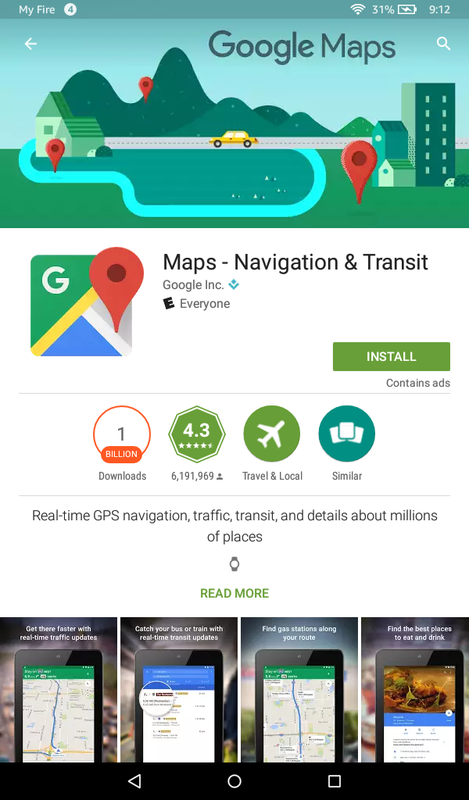 “GPS Signal Not Found” Error: Turn off “Location-Based Services” and launch Google Maps. 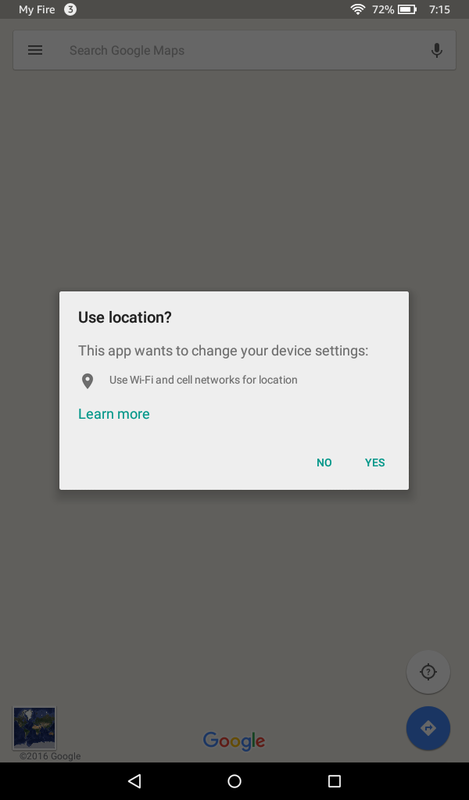 You should be prompted to “Use location”, hit “Yes”. 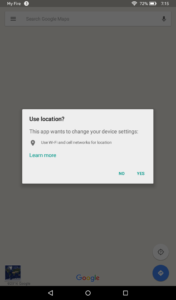 If you did not get the pop-up, hit the detect location button and you should be prompted to “use location”. You should now be able to see your location on Maps. Exit and launch Pokemon GO. If you are still getting the error, go to “Location-Based Services” and make sure it is turned on for Play Services, Maps, and Pokemon GO . “Our servers are experiencing issues. Please come back later. :” Check if the Pokemon GO servers are down just for you or everybody, here. Known Bugs: AR Mode does not work. If you were able to successfully install and run Pokemon GO, please let us know in the comments below. If you were not able to get the game running, please let us know as well. Please include your device in your comment. I credited you. Keep up the good work! Got it working but it freezes a lot now. Great to have it installed right. Also great to have Google play installed. “Your device isnt compatible with this version”. 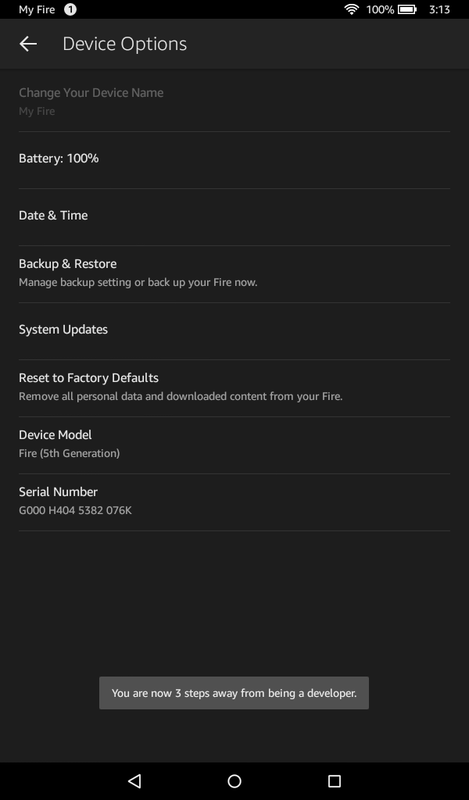 I have fire 5.3.1.0 but it says not compatible with my device. Please help! I just get a parsing error on the APK files? I added additional information in the article about parse errors. Which tablet are you using and what OS are you on? Same how do i fix it. My character wont move please help me. It works! With three kids, Pokemon Go has been wearing my phone out; it’ll be nice to throw my phone on hotspot and let them Go with their tablets in the park, now- thank you very much! Thanks for advice. However Pokemon Go doesn’t seem to work without GPS signal, which Kindle Fire don’t have. Any tips? I’m using a Fire tablet that doesn’t have GPS either but it is working for me. It is using location based services instead of GPS. I originally got the “GPS Signal Not Found” error when I did not turn on Location Based Services. Can you post which Kindle Fire you have? Also, did you follow the instructions completely? If you already had Google Play before, please update to the latest files using the provided links in the article. Also, make sure you restart your device after you have installed Google Play and that Location Based Services is turned on. Please let us know if this helped or if you’re still having troubles. 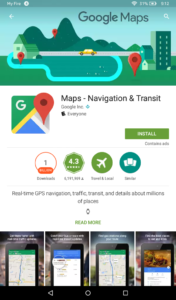 Can you run Google Maps and see if it is working correctly? So, I am running on a kindle fire hd 7, and on Fire OS 5, and I can get in, and I can choose and catch my starter pokemon, it can detect my roads and my rotation, but it cannot detect my movement, I always have the “failed to detect location” on my screen. Please help. Same here. I need Somme help with that too. I also went through all the steps, however, Google Maps will not detect my location. Also, it won’t even let me click the button to do so. I have location services on, and all other apps (including stock Maps app) are locating me just fine. I’m using a Fire HD 7. Any help would be greatly appreciated. Thanks! I have some problem with google play services. I finally got this working by using the new Google Play Services. However, I cannot get the game to switch to any other Google Play account. I would like my kids to be able to sign into their own Google account while I use my Google account on my iPhone. 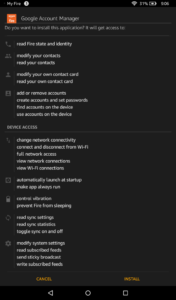 Do you know how to switch the account associated with the tablet? I can’t find where to sign out anywhere. I would like to know this too. I got Pokémon Go loaded on my kids’ Kindle Fires, but only under my log in. I can’t find a way to move it to their screens. Any help with this? To sign out, click the Pokeball at the bottom, then go to “Settings” in the upper-right hand corner. Scroll all the way to the bottom and there’s a “Log Out” button. I can log out. I can not log in with a kid’s account. It logs in automatically to my account at the start each time. hey all, I had the same problem. download the Gmail app from the Google Play store and open it. it will allow you to add secondary accounts to the Kindle. Finally, I can also play Pokemon Go, my smartphone is unfortunately bad. For the “GPS Signal Not Found” error I have a tip. I had the location-based services already activated. The error message appeared. I then switched off and on again, the location-based services. After that, everything worked flawlessly with the localization. I got to step 12 but it puts it as download pending and won’t downloasd google maps. I don’t know what to do about it. Works on $50 5th generation 7″ Fire tablet we got last christmas (11/15), but does on work on $100 4th generation 6″ Fire tablet we got a year earlier (gets the “no gps” error). 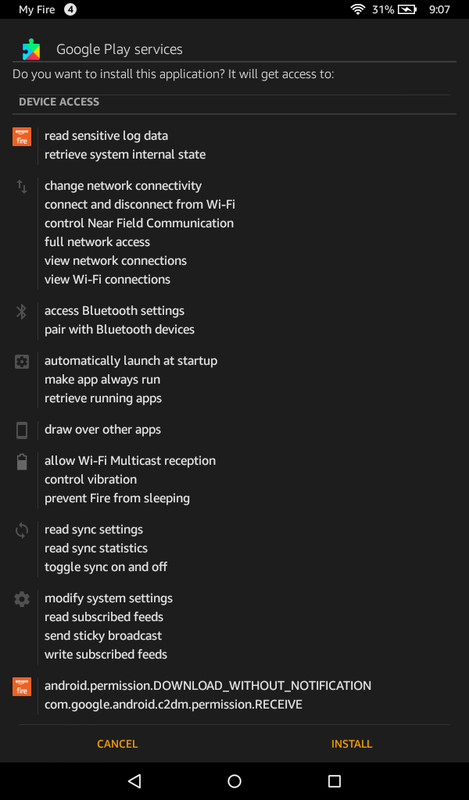 Version’s are fireos 5.1.4 w/ google play services 9.0.83 & framework 4.4.4 on the 7 and fireos 5.3.1 w/ play svcs 9.2.56 & framework 5.1 on the older 6. Works on our Kindle Fire HD 10, latest version. However I live in the middle of nowhere so in some spots GPS is off by more than 500ft. Right now it has me standing in the middle of the lake behind my house. We still managed to get to level 5 yesterday but were unable to see the Pokestop. Every time we got near the GPS would make the avatar sprint away 🙁 Trying to find a GPS booster that will work to correct this now. Is this supposed to work for Kindle fire HD 7″ 4th generation? Because whenever I launch the application, it says failed to detect location. Any fixes? Any tips on how to make this available through “FreeTime” for kids? it seems these apps aren’t showing up as available to her and I’d rather not give access to my profile to my Daughter. I have same issue, don’t want kids going into other apps and tried everything to get app on FreeTime. I’m going to download another app to “lock” the apps I don’t want them accessing on adult profile while I do more research. I get “GPS signal not found”. Hi Followed your steps and Caught me a Bulbasaur on my Plain vanilla FIRE. Nice work. 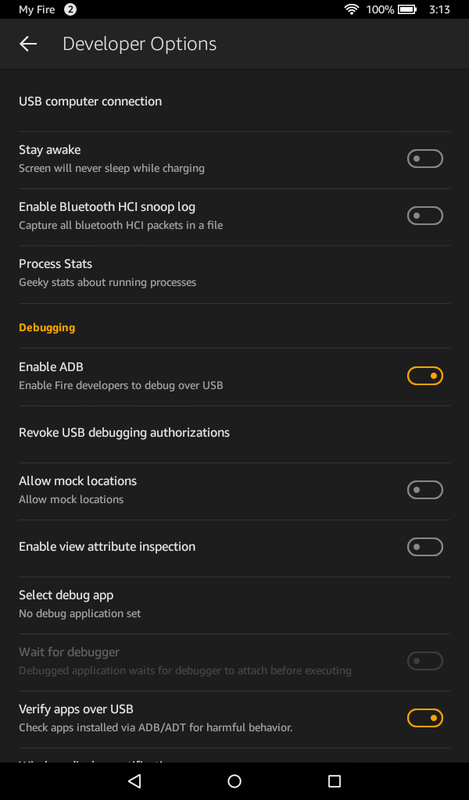 Now if there is any way we can get those dam “Failed to detect location” messages to just go away instead of blocking off certain features on the screens all will be perfect! Do you know of the way to reach mock locations in the settings? I updated the article with instructions on how to turn off mock locations! Thanks Logan for figuring this out. I, got it working on my Kindle . But it’s not detecting anything gyms or pokey stops. I can walk around with my Kindle fire but no Pokemon it’s all not encountered. Can you help me get the Pokémon showing in the pokey stops in the gym’s please and thank you. I get an authentication error saying that I need to sign in to my google account, however, I am signed in. 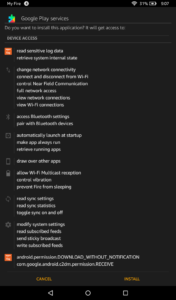 Tried restarting, clearing cache on google apps and it has not helped. 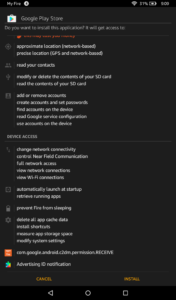 Are you able to set up a cellular data plan on a kindle fire hd? If so, it would be helpful since you need to play Pokemon GO with internet. I heard that is takes away a good amount of data, so I’m trying to find a “cheaper” sevice. All you have to do is hold the app for a second then release. On the top right of the screen will have uninstall. I have it working on my Fire! When I first started it up, Pokemon Go could not find my location. I opened Maps and had it find me then reopened Pokemon Go. Pokemon Go can find me now! I have updated the article with more information. In the meantime, please let us know if your game is working for you (please include your device as well) and if you had to do anything extra to get it running. There are still many people that cannot get the game to run correctly and all of your comments help. Aww well sadly I have os 4.5.5.1 on a 3rd generation fire.. I gave it a shot for laughs but stall out in phase error when I try to open the apk file… oh well guess I’m out of luck..
You downloaded and installed the apk files above right? That’s where I am stuck. I download the files, but it won’t “parse” them. Is there any way to play it without internet connection? Or a service plan? Not with a Kindle Fire from what I can see. You must have a Data source for it wot work. OK now Level 9. Some observations that maybe will help other folks. 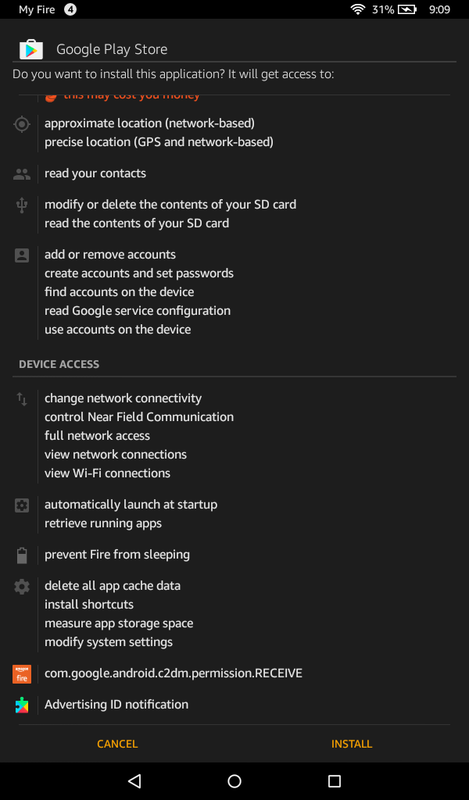 1) Make sure you have the Kindles location settings on. 2) Make sure that “Mock locations” is OFF. Looks like they have blocked that due to cheaters so we are stuck with Wifi positioning only. 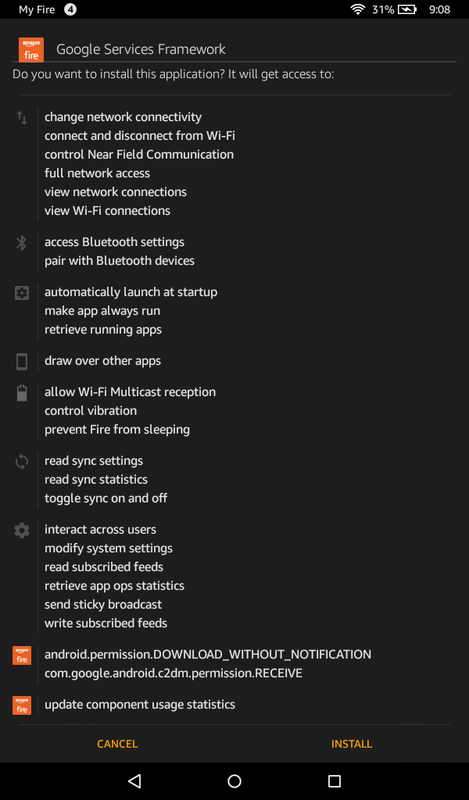 3) Stick to urban locations where multiple Wifi’s can be sensed for best accuracy. Parks usually wiull not work so well. 4) Due to the Wifi location systems limits you will usually be lagging behind your real world position by about 25 feet. This can be annoying but you can also use it to your advantage if you time things right. Are you certain you have “Mock Locations ” in the OFF position? What you describe was what happened to me but turning it off fixed it for me.?? Google Maps doesnt work, dont know why. I live in latín América. Doesn’t work very well. When I walk outside my house my character will go the opposite direction I am going and will take like 20 seconds to fix itself. Also, since my kindle does not have a hotspot I cannot use it that much farther from my house anyways. Btw I have 5th generation kindle fire. Awesome!ll worked 100% sometimes I get a message saying “GPS signal not found” but if I wait a few seconds it worked very well! Thanks!!! For Kindle Fire HD 7 4th Gen owners out there, I’ve got mine to work. Both Google Maps and Pokemon Go are detecting location via WiFi. And I’m running the most recent version Fire 5.3 firmware. Here’s how I got it to work. 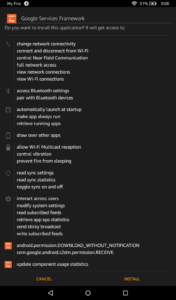 First, side load all necessary APK’s in order to run Play Store. Make sure you have the latest version of Google Play Services. At the moment of this writing, the version should be 9.4.52 (230-127739847). 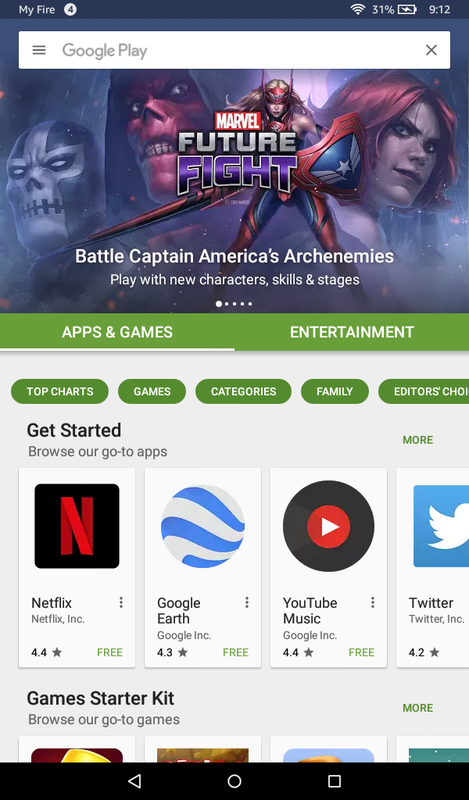 Once you can log into Play Store, you can pretty much download whatever apps you want. That said, install Google Maps and Pokemon Go. 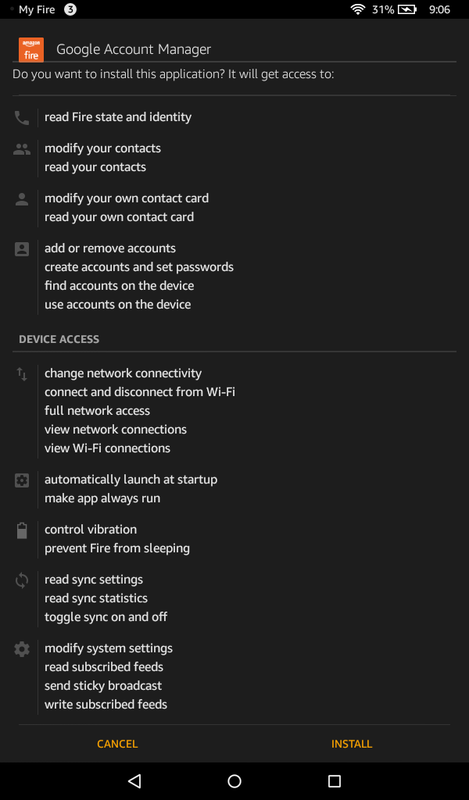 Now, before you run any of the two apps, go to Settings->Wireless->Location Based Services. Turn it OFF. Yes, that’s right, turn it OFF. Next, run Google Maps. Once it’s up and running, you will notice the current location button (dot) has a tiny question mark on it. Press that. It may take a couple of seconds for Google Maps to ask you if you want to turn on location services. Say YES. In another few seconds, you will notice the navigation/location icon showing up on the top right corner. It may disappear but that’s OK. Now press the current location button(dot) again. It should take you to where you are on the map. Guess what’s next? Bingo, launch you Pokemon Go app! You should be able to move around w/o any issues as long as you have WiFi access. Tried this method and works perfectly. Thank you! I followed all the directions however google maps won’t download. it just keeps saying download pending. There is no other apps downloading. Any ideas on how to fix this? I tried other apps in the google play store and have the same problem. 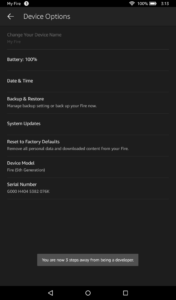 I’m using a generation 5 Kindle fire with the latest updates. I have this same problem; I cannot download anything whatever I try. 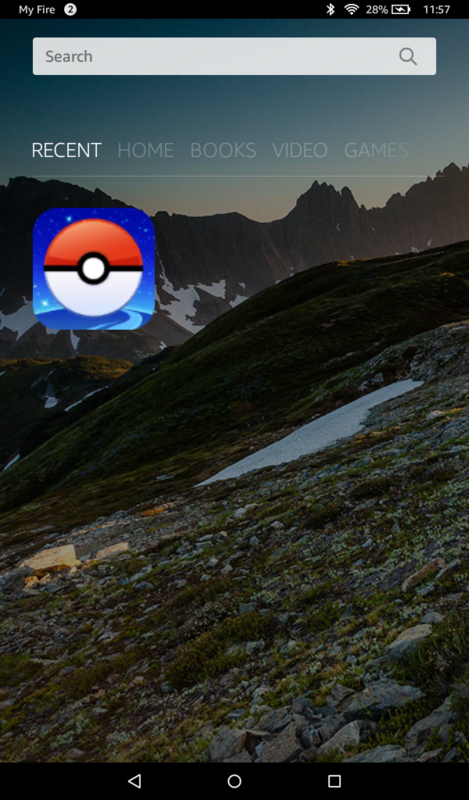 Mine “works” but it is also stuck on the first part where you have to catch the pokemon, the pokemon never swawn, just the circles. I do not know that this works all the cases but I initially got the error message, saying that “No GPS Found Error”. I followed the instructions given here. 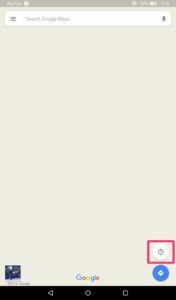 I also installed “Google maps” but it does not work (My location cannot be shown on the map.). 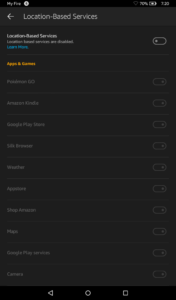 To make sure whether the GPS function does not work on my fire tablet, I installed the “Google maps” that can be downloaded from amazon application store ADDITIONALLY. So, I installed 2 google maps, one from android PLAY store, another one from amazon application store. After I installed both Google maps, my fire tablet can detect my location for both Google maps. I do not know what happened to my fire tablet but IT WORKS!! I just need more volunteers to test whether GPS function would work after installing 2 google maps.. 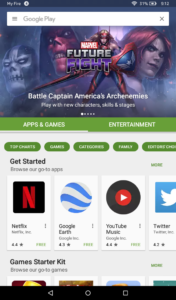 The Google Play Store won’t open.. Please help me! You must download the following APKs and installed. Just click and install according to the top of this page. Go to bed timmy. Your drunk. worked perfectly!! not only for the pokemon go, but i was struggling playing summoners war without google play, it was a pain every time they updated the app. It works, but you must follow the instructions exactly. Location services can be accessed through maps. Only works after you agreed to share location in maps. Might take a few attempts! Managed to download fine, however I’ve turned mock locations off and it’s still not picking up gyms poke stops etc and it’s not detection any Pokemon. Hi firsst let me thank you for the great work you does. I did the Video Tutorial and it works fine on two fire Tablets. The only issue i got is that my gps tracking does not work in Parks and some places with trees. When i go normally in the city it´s ok and the tracking works fine with my Hotspot on my phone but when i even go one step in a park nearby, the GPS tracking stands still or run 1-2 Kilometer in a random Location. I tried many things with the Locations Switches but nothing seems to work. My guy doesnt move inside the Park. Maybe you can give me a advice to solve this Problem. I followed every step in this tutorial but still could not get Pokemon Go to work properly and spent hours online trying to find solutions – the application would open but the avatar wouldn’t move, the maps weren’t showing properly, and there was no ball and no way of catching any of the 3 pokemon at the avatar’s feet. UNTIL I downloaded our local area to work offline in Google Maps. After that I could suddenly see the maps background in Pokemon Go, the character could move around, the camera turned on, the ball appeared and we could catch Pokemon – HURRAY! So step 14 is wrong, it should be LBS but be enabled for Play Services, Pokemon Go, and Maps. Once I enabled it for play services the NO GPS error went away. Do these steps still work with the latest Pokemon Go update, 0.35.0? I’ve got an 8 year old about to spend most of his money on a new $50 Fire just for this, so I’d like to be sure. Thanks for any help! Thanks for the guide! I was able to install Pokemon Go on my daughter’s Kindle Fire 7HD and it works okay. We use it in combination with my iPhone 5, having Pokemon Go installed, too. And it makes us go on walks together a lot which is a nice thing. Locations are not very precise. At times this even can be an advantage – covering more range for finding Pokemon spawns. Some times, it is just a little annoying – we found out where we have to go to for example access some of the gyms in the area (when my daughter’s Pokemon Go locates her some distance away when we are standing right at the correct gym location). But there are three or four gyms close by where we simply can’t find a spot for her to access. In two cases, it’s most probably because we just can’t move in the direction we would need to go for her to be detected in the right spot (the places are not accessible). In the other cases, her location jumps from one side of the gym to the other, and she is never located in the right place to be able to access the gym. Just wondering: Are other people experiencing the same thing? And is there a way to fix it? Is this still working after the .37 update that breaks all rooted/rom devices? If this still works, I may consider buying the cheaper Kindle fire just for PoGo, because I am NOT going back to stock on my phone. i got the 0.37 update today and it´s working fine for me. I got the apk from the Internet because the release is not out yet. When the app store got it i reinstall it because the updates won´t work with the apk only. Works fine for me on my kindle fire tablet 5th generation. Had to resort to kindle fire because phone is rooted. Using this I got it running perfectly on my Fire Phone. Thanks a bunch. If your device is on Fire OS 5.0 or higher then it can run Pokemon Go. To check your OS, go to Settings > Device Options > System Updates. This all downloaded smoothly, but when I realized I am not leaving the house with my kindle, I deleted Pokémon go. But going through the process of downloading all these Google apps, I downloaded Google play. So now thanks to that, I can download any all from the store. Thank you. Everything worked for me! That’s awesome since I can’t play on phone due to it being rooted. Seems to sometimes work and sometimes not but perhaps some people aren’t fully reading the instructions? It will not work I opened google play appmand it went home! Which device are you using and what OS are you on? Google play will not open. Any advice? If the Play Store does not open anymore, please uninstall Google Services Framework, Google Play Services, Google Account Manager, and Google Play Store, then download the latest versions of each one and install them in order (1. Framework, 2. Services, 3. Account Manager, 4. Play Store). I have updated the tutorial to reflect this. These Pokemon Go instructions worked flawlessly on the Kindle Fire 8 (5th generation). Thank you so much. I am going to buy a $50 5th generation 7″ Fire tablet, and a lot of people have stated pokemon Go works great but if you play on your iphone and make it a hotspot for kindle fire and they are on a different account will that work two different google accounts running at the same time?? Yes, you’ll be able to play on your iPhone and Fire tablet at the same time as long as you are on different accounts. I just want to Thank you very VERY much!! I originally used your tutorial 6 months ago for my old cheap Kindle tablet that I let my daughter use after she dropped her $300 tablet into a mop bucket (ONLY MY DAUGHTER COULD DROP AN EXPENSIVE TABLET INTO A 6″ DIAMETER CIRCLE INSTEAD OF ANYWHERE else in a ROOM) and it worked perfectly…..Except for 1 minor problem, which was not your fault at all!! The only problem is that she would “teleport” to down the street from where we were, even standing still at our house. Sometimes this wasn’t a problem since she would catch things that we never could find, but then she couldn’t catch things that the rest of us did bc she was still down the road. Oh well- it evened things out!! Anyway, thank god I found your tutorial again bc it helped out on my son’s new Fire Kindle 8 HD so thank you once again!!! You made his entire day….and mine so I dont have to share my phone anymore!!! Thank you soooo much for these instructions … my phone was at serious risk of my son damaging it, but now I can just put it on hotspot and off he goes on his own fire.